Eleven new rock music classics will be "Uncovered" at a Bellingham, Wash., CD release party on Saturday. The new songs by the Walrus, Bellingham's premiere classic rock band, will be released after some two years in the making. A CD release party is scheduled for 8:30 p.m., Saturday, Nov. 18, at the Wild Buffalo House of Music on Holly Street in Bellingham. Opening for the Walrus will be Vadinska. The five seasoned professionals who make up The Walrus have been energizing nightclubs, community festivals and private parties in the Pacific Northwest with classic rock cover tunes since the band formed nearly 11 years ago. Now they are poised to delight their growing fan base with a collection of original, "uncovered" tunes that evoke and combine the melodic harmonies of the 1960s and the psychedelic musical arrangements of the '70s with present day inspiration and modern recording techniques. Of the 11 new songs on 'Uncovered,' seven are written by lead guitarist and vocalist Joe Young, a prolific singer-songwriter; two are by singer and guitarist Chuck Dingée; and another two are written by vocalist and keyboard player Jamie Shea. Drummer Michael O'Neal and bass guitarist Walt Burkett provide the backbeat and also sing on the new tracks. In addition to precision vocal harmonies, haunting strains from the violin of the late Guy Mulford, who played at the Walrus' first public gig in 1996, are heard on 'Guy's Song,' a tribute to the beloved musician who died on Jan. 1, 2001. Mulford's posthumous fiddling is also a tribute to the high-tech recording equipment and talent at Bayside Recording in Bellingham, where the album was produced and recorded over the last two years. The Walrus CD is rich with classic rock, pop and folk vocal arrangements; ballads about friends who are like a 'Second Family' and about empowerment; screaming electric, acoustic and pedal-steel guitar licks; and love songs about absent as well as cheating lovers. The synergy of original themes and lyrics combined with Sgt. Pepper-inspired rock song melodies points to the versatility and experience of Bellingham's rockin' sea mammals. Two songs on the long-awaited album are directly inspired by the Beatles, the Walrus' favorite band to cover. Young's 'Abbey Road' describes the ups and downs of rock music stardom, and 'Hold Your Hand' is a 96-second dance number with harmonies as crisp as The Beatles' No. 1 hit, 'All My Loving' (and reminiscent of a number of early Beatles songs including, of course, 'I Want to Hold Your Hand'). "Audiences where some of the 'Uncovered' songs have been played have told us they are certain they've heard these rock songs before because they have such a familiar sound," Dingée said. Shea adds that the classic rock sound has an ageless popularity. "It's not only the Baby Boomers who can relate to the Walrus' classic rock style," Shea said. "Some of our most appreciative fans are kids in their 20s whose parents serenaded them with songs like the Beatles 'Golden Slumbers' instead of 'Rockabye Baby.' "
She added: "Given a choice between angst-ridden teen rock and over-produced pop, many young people prefer to turn to the more cheerful and down-to-earth classic rock groove." Shea says she looks forward to singing and playing the group's new songs as well as cover tunes by Jefferson Airplane, Led Zeppelin, Queen, Kansas, Mamas and Papas and others at a series of CD release events over the coming months. In addition to the Nov. 18 gig at Wild Buffalo House of Music, the Walrus will be performing -- and selling the 'Uncovered' CD -- at the Fairhaven Pub & Martini Bar in Bellingham on Dec. 1. Opening for the Walrus on Dec. 1 will be the popular Seattle acoustic band, The Senate. 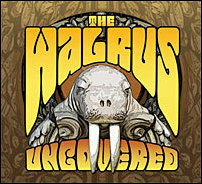 'Uncovered' can be purchased for $15 from members of the Walrus. It will also be available soon at music stores and online music sites. For more information about the Walrus, including photos, a list of songs and booking information, go to http://www.tusktusk.com or http://www.myspace.com/iwalrus.